The folks at Valley Preferred Cycling Center wanted a whole new Website, and that’s what we gave them! Thevelodrome.com was completely redesigned. The brand new Website debuted in time for the 2014 season. The goal of the website redesign process was to create a more user friendly and engaging website for visitors to access. The newly redesigned thevelodrome.com allows users to access everything Valley Preferred Cycling Center has to offer, in a clear, easy to use manor. We added a bevy of new and exciting features to the website, not the least of which being the new option for fans to purchase tickets online. We also added a new calendar that’s not only great looking, but allows users to access all the information they need on whatever event is taking place that day. There is a calendar located on the homepage, a calendar on the upper right of each individual page, and a full calendar located on the Full Calendar page. Clicking an event on both the homepage and sidebar calendars creates a drop down style action which contains the event location, time, google maps directions, and a link to learn more about the event itself. We redesigned the menu to make everything easier to find. 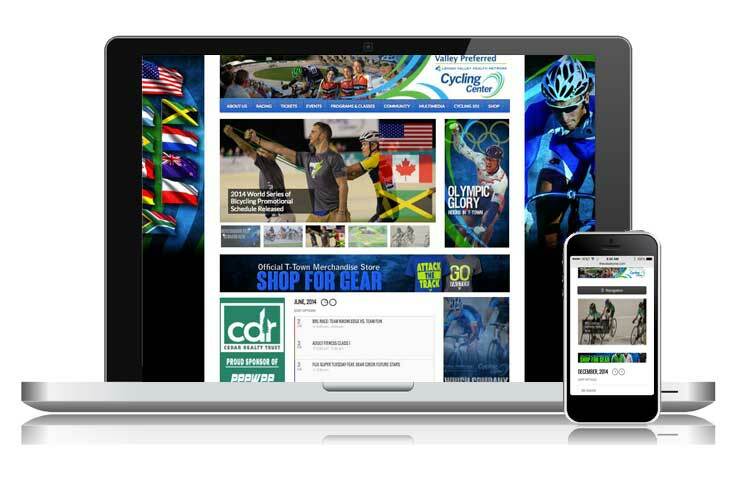 The brand new navigation menu on thevelodrome.com allows users to navigate the site with greater ease than ever before. The menu contains information about Valley Preferred Cycling Center including staff directory, history, etc., information on our racing series, including information for fans and riders, ticketing options, race results, and more. Visit TheVelodrome.com to fully explore this exciting new Website!